Synthetic peptide within Human MMP3 aa 450 to the C-terminus (C terminal). The exact sequence is proprietary. Our Abpromise guarantee covers the use of ab52915 in the following tested applications. WB 1/1000 - 1/20000. Detects a band of approximately 50 kDa (predicted molecular weight: 54 kDa). Immunohistochemical staining of paraffin embedded rat kidney with purified ab52915 at a working dilution of 1/50. The secondary antibody used is ab97051, a goat anti-rabbit IgG (H&L) at a dilution of 1/500. The sample is counter-stained with hematoxylin. Antigen retrieval was perfomed using Tris-EDTA buffer, pH 9.0. PBS was used instead of the primary antibody as the negative control, and is shown in the inset. Immunofluorescence staining of HT-29 cells with purified ab52915 at a working dilution of 1/100, counter-stained with DAPI. 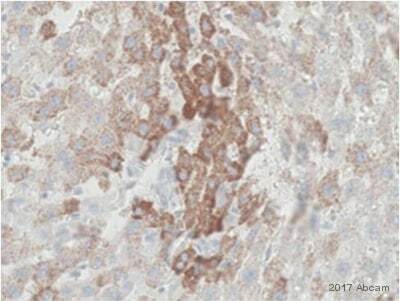 The secondary antibody was Alexa Fluor® 488 goat anti-rabbit (ab150077), used at a dilution of 1/1000. ab7291, a mouse anti-tubulin antibody (1/1000), was used to stain tubulin along with ab150120 (Alexa Fluor® 594 goat anti-mouse, 1/1000), shown in the top right hand panel. The cells were fixed in 100% methanol and permeabilized using 0.1% Triton X 100. The negative controls are shown in bottom middle and right hand panels - for negative control 1, purified ab52915 was used at a dilution of 1/500 followed by an Alexa Fluor® 594 goat anti-mouse antibody (ab150120) at a dilution of 1/500. For negative control 2, ab7291 (mouse anti-tubulin) was used at a dilution of 1/500 followed by an Alexa Fluor® 488 goat anti-rabbit antibody (ab150077) at a dilution of 1/400. Immunohistochemical staining of paraffin embedded mouse liver with purified ab52915 at a working dilution of 1/50. 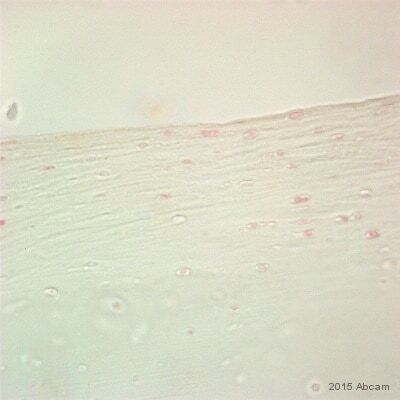 The secondary antibody used is ab97051, a goat anti-rabbit IgG (H&L) at a dilution of 1/500. The sample is counter-stained with hematoxylin. Antigen retrieval was perfomed using Tris-EDTA buffer, pH 9.0. PBS was used instead of the primary antibody as the negative control, and is shown in the inset. Immunohistochemical staining of paraffin embedded human liver with purified ab52915 at a working dilution of 1/50. The secondary antibody used is ab97051, a goat anti-rabbit IgG (H&L) at a dilution of 1/500. The sample is counter-stained with hematoxylin. Antigen retrieval was perfomed using Tris-EDTA buffer, pH 9.0. PBS was used instead of the primary antibody as the negative control, and is shown in the inset. Does this antibody recognize total MMP3 or active MMP3? This product will detect total MMP3. The MSDS can be downloaded from website. It is now linked to the datasheet.